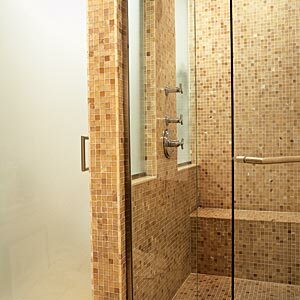 Shower enclosures come in a range of designs so you can find the right one for your bathroom design. And they don’t have to be dismal, unattractive, moldy affairs. New designs in bathroom furniture, showers, baths and sinks means you can create a bathroom to die for. You don’t just have to see shower cubicles as basic structures – yes they are functional, but they can also express your individuality and suggest whether or not you have a flair for style and design. With luxury shower cubicles on the market, you can literally transform your bathroom by taking a little care in choosing the best shower enclosures for your room. A well designed shower cubicle can make a bathroom, so when designing your room, why not make a feature of a overlooked component of your room. Ask us for ideas.